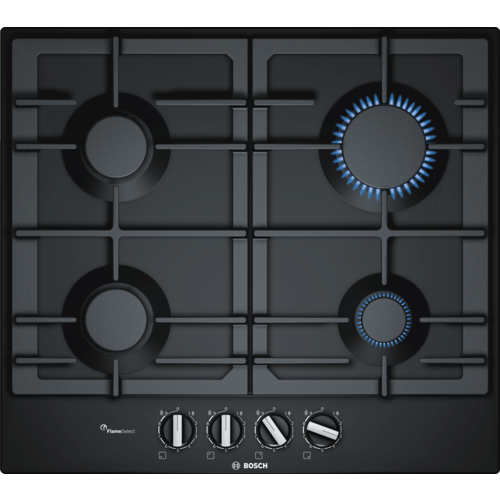 The Bosch PCP6A6B90 Gas Hob, in black, is a stylish hob for ultimate control at your fingertips. Gas hobs provide you with instant heat and are easy to control, that's why most professional chefs use them. Ignition is built into the dials so with one simple turn you can fire up the zone you need. Get maximum stability with the cast-iron pan supports. Perfect if you sometimes need to use heavier duty pans when cooking. Plus they're easy to clean as they come away from the hob frame.